Revels Houston presents An Elizabethan Celebration of the Winter Solstice for two weekends, December 13-14 and December 20-21, 2008 at Lowe Theater, 2707 Buffalo Speedway (at Westheimer) on the campus of St. John’s School. Call 713-669-9528 or visit http://www.revelshouston.org/. Shulamit Kleinerman will be the featured guest artist for Revels Houston’s all new production of An Elizabethan Celebration of the Winter Solstice. The Seattle-based musician brings her extensive experience in early music, along with her enthusiasm people to all ages to participate in the vibrant music of this era. 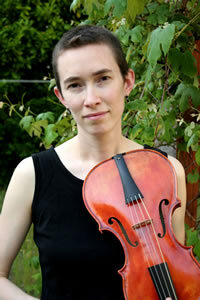 Kleinerman fills us in on her involvement with Revels Houston and her life in early music. Shulamit Kleinerman: I met some other early-instrument players in 2005 when we were all performing at a Renaissance fair outside of Seattle. They asked me to join them in the Tacoma Revels that year, and I returned to play with them in the Portland (OR) Revels the next two seasons. It’s a natural fit when you’re already used to playing early music in historical costume. NW: What makes a Revels show a unique theatrical experience? SK: One of my favorite moments in Revels is a magical little speech that someone always gives near the end, written by Susan Cooper, the children’s author who wrote the wonderful Dark is Rising books. It’s a really moving moment about the winter solstice and how meaningful it has been to people through the ages to celebrate the turn towards spring. Hearing this during the run of each Revels show in different cities has become a winter ritual for me now. That’s what Revels sets out to do-to create new celebratory moments for modern people that draw on a rich human history. It’s also a wonderful experience for the children in the cast. They don’t have to be child prodigies-they’re just kids doing songs and dances that other kids did in the past, and getting to be part of this larger theater show with grownups. I think it’s nice for the kids in the audience to see that, too. NW: I understand you have done the Elizabethan show before. What makes this show stand apart from the others? SK:The story of how the great Shakespeare comedian Will Kemp traveled from London to Norwich entirely by Morris dancing makes a perfect frame for a theater show. For me personally, it’s especially fun because I have spent a lot of time with the dance tunes of early seventeenth-century England. SK: I’ll be leading the early-instrument band. The three others play recorder, lute, and bass viola da gamba. Part of my job is to choose some of our music. We will be playing some pieces from a collection that was published around 1600 for just this kind of ensemble-a high string, a recorder, a bass gamba, and plucked strings. We’ll also be developing some improvisatory jamming together. Players in the Renaissance were great improvisers-it was like jazz. NW: Do you get to dress up and roam around or do the musicians need to stay put? SK: We’ll be part of the drama on stage. Our role is to portray the local musicians of the town of Norwich, where the action is set. Sometimes we accompany singing and dancing, and a few times we also have a purely instrumental set, playing for the villagers onstage. NW: Tell us a bit about the instrument you will be playing and its history. SK: I’ll be playing two instruments. One is a tenor viola da gamba, which means "bowed string instrument of the leg" (in Italian) because it’s held between the legs, like a cello. The viol family have six strings and frets, like guitars, and they have flat backs that give them a more hollow sound than the violin family. They are older than the violin, which was seen as a rude young upstart when it first appeared, suitable only for tavern fiddling and dancing. I play the violin as it was played in the Elizabethan era, with the instrument held low on the arm. This playing position still survives among Cajun and Old-Time fiddle players. SK: In college I got into Baroque playing with the student early music ensemble. We also tried a bit of off-the-shoulder Renaissance playing, which I loved but I didn’t think I could possibly get away with playing that way all the time. I studied for a year in London, and then the next year I got tendonitis. When I started playing again after two years, still not completely healed, I couldn’t play any way BUT off-the-shoulder. It was like a nudge from the fates to specialize in this type of playing that I was already so drawn to. NW: I understand you will be playing with gut strings to get that "authentic" early music sound. Can you describe the sound, and does the gut string choice come with any special challenges? SK: The strings on the viol and the violin are made of sheep intestine, which gives them a softer, more intimate and subtle sound than modern metal-wrapped strings. Being an organic material, they are more sensitive to temperature and humidity, so they’re harder to keep in tune. They don’t project as loudly as modern strings are made to do, but they have a special kind of warmth that responds to the bow in a different way. The very first day I played a gut-strung fiddle in college, the instructor stopped the ensemble and said to us, "I hate to put it this way, but these strings were alive once — and you have to treat them that way." That’s still the best description I’ve heard. NW: A revels show can get pretty rowdy in that there are times when the audience is part of the show. How does that relate to how people actually experienced early music? SK: People in the Renaissance would have found it very strange to sit quietly in a darkened concert hall. For them, music was all about the social context and the human interactions. Music was for dancing and singing and seeing spectacles, like royal ceremonies. So the Elizabethan show brings back some of that human context in a way that modern people can engage with. NW: I understand you have a particular interest in teaching living history classes and workshops. Can you describe what happens in one of these workshops? SK: When you put the arts of the medieval, renaissance, and baroque periods in context, with costumes and dancing and swordfighting and period cookbooks, kids are really drawn to them. I do summer workshops for elementary school kids where we’ll focus on an era and explore everything we can, whatever seems to capture the kids’ imaginations. Shakespeare skits have been really popular recently. The kids will get really into singing in Latin or Middle English if you choose fun tunes and present them in an accessible way. And they love trying all the old instruments. NW: You are also an expert in early dance forms. Which ones and how does that inform you as a musician? SK: I studied Baroque dance, which is the ancestor of ballet, a little bit in London. When I had tendonitis and couldn’t play for a couple of years, I got more serious about dancing and performed in an opera in Seattle, and I also studied and performed Italian courtly dance from around 1600 and early English country dance. Dancing definitely made me understand better what the tempos should be for different kinds of tunes. And I got really into the early English country dance repertoire and I’ve just released a CD of my own duo arrangements of that music. The pictures of dancing from the time usually show just one or two melody instruments, often two fiddles, accompanying the dancers. That’s a really different way than we usually hear these tunes, and I wanted to explore it. There’s endless riches in those melodies, and with just two players, you really have the space to get creative with harmonies and improvisations. SK: Maybe to forget about thinking of it as "early music" at all. It’s just music. Sometimes people get scared that it’ll be too dry and dusty and serious, just because it’s old. "Early music" includes everything from Gregorian chant to bawdy songs to Vivaldi’s Four Seasons. Some of it is just lullabies, or really energetic fiddle tunes. I love playing early music outside the formal concert setting-in Revels, or at parties or with kids, where you get to focus on the liveliness of it. SK: I haven’t been in Texas before and I don’t know the landscape of this part of the country at all. I’d like to check out the Arboretum. I’m looking forward to taking a break from Seattle’s dreary winter.